The Celebration of Light fireworks return to Vancouver this summer as English Bay will be lit up for four explosive nights. The award-winning team from the USA will try its hand dazzling the crowd on opening night. Fresh off a World Cup run Spain will take to the beaches to launch an impressive performance. Mexico has been a part of the Celebration of Light for several years and they always have a strong showing with vibrant colours and accompanying music (if you have a radio near by). Often a winner of the Celebration of Light competition, China’s performance usually blows away hundreds of thousands of spectators who look on in awe. About their show: Coming from a wonderful Chinese history tale, the public will travel through a world full of sound and visual and they will enjoy exotic choregraphies of fireworks which will take on a whole new dimension. I ran a poll last year asking if people would miss the fireworks if they were gone/canceled for the summer and over 60% said yes (the rest said “good riddance” or left other comments). Regardless, they’re back again for their 20th year in 2010. You can watch the fireworks from front and centre in English Bay, across the way in Kitsilano, or on the water (from a safe distance) by boat cruise or kayak. 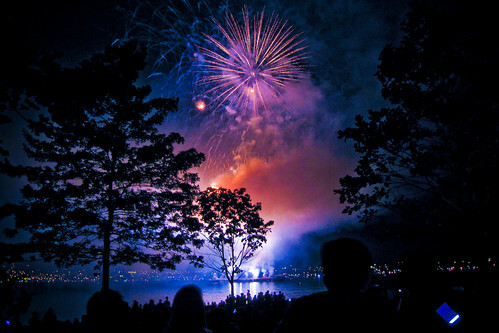 Shore 104.3FM will also be presenting the ShoreFest concert series on the beach before the fireworks begin. Follow the Celebration of Light on Twitter for updates and information. I haven’t seen the fireworks in years. It’s too much of a hassle with a disability. I enter those boathouse contests and stuff but no luck. I don’t think the fireworks will ever be canceled. Someone _always_ steps up to the plate to help sponsor. I think its a marketing thing anyway when they say we wont have it each year. I do like how we can watch them from our balcony though. Last year when we went down to watch with the crowds a fight broke out in front of us and people kept shoving robyn and me towards the scrappers. 30 seconds later VPD dove in, tackled the two kids fighting and hand cuffed them. guess that’s happens when you put over 300,000 thousand people together in a small space where lots are drinking and high on drugs etc.